The Grove Villas is a residential styled complex that incorporates five individual villa units in the semi-rural district of Umalas. Each villa is a contemporary retreat that has been designed for optimal relaxation away from the frenzied pace of mainstream tourist activity. The property offers a choice of two, three or four bedroom villa categories to accommodate families and small groups of friends. Each villa has a similar design aesthetic that is essentially modern with a few eclectic pieces of artistry to add an element of surprise. The Grove Villas is located in the village of Umalas, an area that is still blessed with fertile rice terraces and a laid-back way of life. It is a place to truly escape the trappings of city living and spend quality time reconnecting on a personal level with loved ones. Airport pick-up service upon arrival. High Season Periods High season period: June 15 - August 31, Chinese New Year. This newly refurbished villa category resembles a tropical townhouse complete with an infinity edge swimming pool, sunken deck and outdoor shower. It is a refreshing look that takes typical Balinese villa design to the next level without compromising comfort or convenience. The ground floor is a well-defined space with full-length glass doors that open wide for direct access to the pool. There is a high-end kitchen facility with sleek appliances and a social dining area at one end. A smart living room is separated by a timber staircase and guest bathroom. Both bedrooms are located upstairs and distanced by a small foyer for privacy. 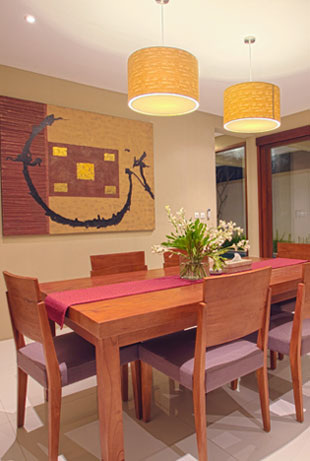 Each features a calming decor with modern artistic accents. The rooms each have a classic marble en-suite bathroom and the larger of the two has a bathtub for spa-styled bathing indulgence. 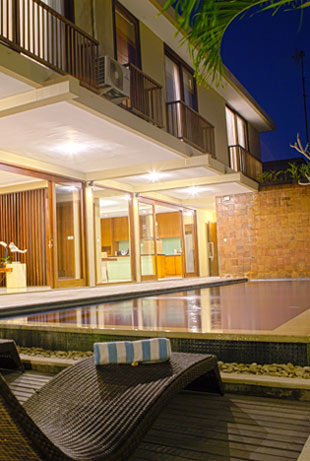 The three bedroom villa also recreates the ambience of a tropical townhouse with its attention to detail and customised decor. 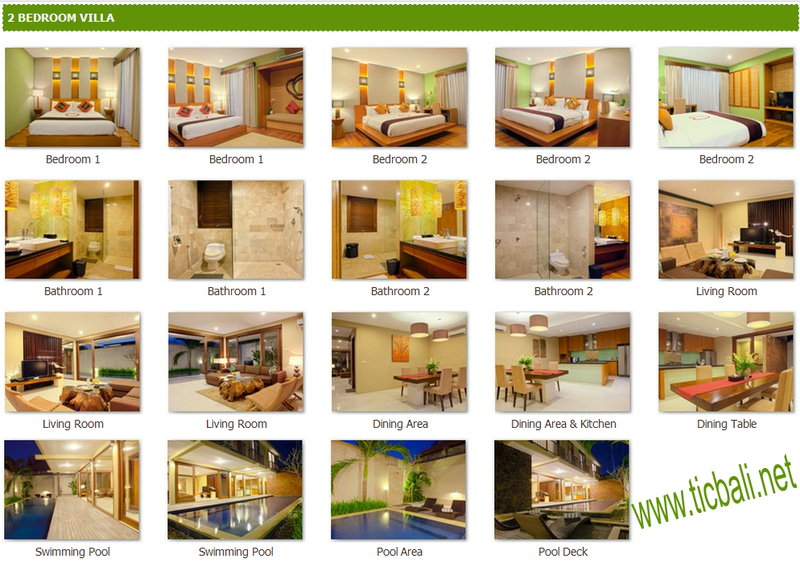 The entire outdoor area takes advantage of Bali's summer climate. A generous sized swimming pool is edged by a timber deck for lying back and soaking up the sun. The ground floor is a carefully divided space with sliding glass doors and direct pool access. At one end is a gourmet kitchen and dining area, while the separate living area is a cosy space to gather with loved ones. 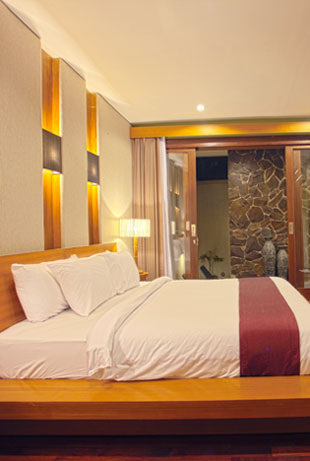 A comfortably appointed bedroom and en-suite is secluded at the far end. Two additional bedrooms are located upstairs. Each is a private adult sanctuary that features a calming decor with modern artistic accents. Both rooms have an elegant en-suite bathroom in creamy marble, while the larger of the two has a bathtub for spa-styled bathing pleasure. This spaciously appointed split-level retreat is located at the far end The Grove's private laneway. It has a secured parking area to accommodate at least two rented vehicles or a handful of motorcycles. Recently refurbished, this family style villa embodies tropical living with a design concept that embraces the outdoors. The ourmet kitchen and dining environment is an integrated space that is open to the elements. The lounge is also a refreshing open-plan area facing the pool. The master bedroom is an adult sanctuary bathed in natural sunlight with views of the pool and a garden alcove. It comes with ample storage space and a lavish en-suite bathroom. A generous sized tub set beneath an inspiring picture window has been created for soothing bathing rituals. There are two more bedrooms with en-suite bathroom facilities located upstairs that are suitable for children or adult guests. Each has a modern decor in earthy shades to promote restful slumber. One room leads to a multi-functional terrace for taking things easy under the sun or stars. is the perfect hideaway for a teenager seeking time alone. This room has its own timber deck and a small patch of garden. The Grove Villas is located in the village of Umalas, an area that is still blessed with fertile rice terraces and a laid-back way of life. It is a place to truly escape the trappings of city living and spend quality time reconnecting on a personal level with loved ones. The excitement of downtown Seminyak, with its sophisticated wining, dining and shopping scene, is just a 10 minute journey by car. The nearest beach for a great day of sea and sun is in the neighbouring village of Petitenget. The international airport is 30 minutes away.